With a tagline, “Creating the Entertainment City of the Future”, and the exploration of how Los Angeles is creating the entertainment city of tomorrow. From virtual reality to artificial intelligence and social networking, entertainment in the 21st century will engage all the human senses and connect people in new ways. What implications are there for network build out, smart cities, content creation and fan engagement? How could anyone pass on an opportunity to see and hear this unfold? Well, Dakar Media Academy, and a contingent of student, educators, and stakeholders in Los Angeles County- K-16 career development of the creative economy took front seats @ The AT&T Shape 2017, July 14-15th, an ambitious 2-day mash-up of what’s is on the horizon in tech-entertainment for everyone on the content, business, and consumer front. Our thanks to AT&T Vice President Of External Affairs, Marc D. Blakeman for giving us some encouraging words and some context to AT&T’s vision and outreach for an organization like ours. We’d also like to extend a shout–out to our AT&T friends, Donovan Green, Amir Johnson, and Diversity, consultant, Tanita Ballard who shared AT&T’s external outreach strategy in Los Angele County with our contingent of LAUSD principals and COBA executives, Krishna Smith, and Donald Moorer. Dakar participated in the AT&T Shape Creathon two months ago, but our project didn’t get selected as a finalist, but it allowed us early registration to receive 15 passes valued at $100 each. We disseminated the passes to recently graduated 18-year-old students who were tasked to register for the event and capture their experiences through blogging, tweeting, and video capture. This assignment to emotional maturity and independence to execute their arrival and to enable them to participate as editors and share AT&T Shape experience as publishers with the LA-Hitech cohort, many of them who will benefit in future project-based learning experiences. Our thanks to AT&T Vice President Of External Affairs for giving us some encouraging words and some context to AT&T’s vision and outreach for an organization like ours. We’d also like to extend a shout–out to our AT&T friends, Donovan Green, Amir Johnson, and Diversity, consultant, Tanita Ballard who shared AT&T’s external outreach strategy in Los Angele County with our contingent of LAUSD principals and COBA executives, Krishna Smith, and Donald Moorer. Some of the highlights of our two-day invasion of the Warner Brothers lot was the speaker presentations by Kathryn Bigelow and Lance Weiler. There were far too many people on Friday, but Saturday’s line was about a third less and provide opportunities for us to brave the much smaller lines. Our students took video of every experience, especially the speakers who were all live streamed, but the archives will be published sometime in the near future we were told? 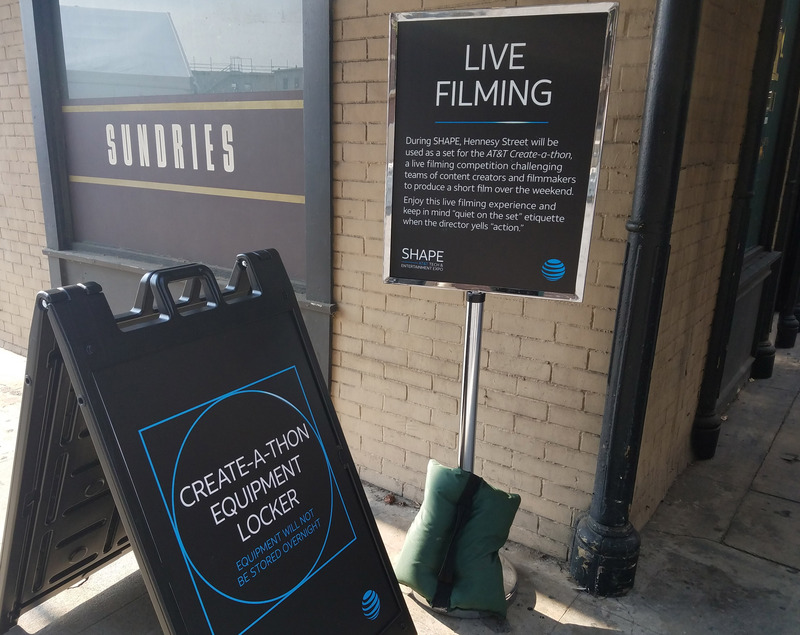 So are hours of video may be the only evidence you may see in this AT&T Shape Speaker Series. We missed the DC story-telling presentation, but we more than made up with our whiff with our one-on-one discussions with exhibitors, Rick Hack from Intel, John Sundar Hsia from AT&T Creator Camp, and Nina Joshi, Ericsson from the AT&T Foundry. The AT&T Shape Hackathon was won by young ladies who received $20,000 in cash and was the STEAM activity that we’d like to emulate year around as curriculum. The Hackathon not only exposed students to the processes of participating and competing for cash prizes, but can expand the efforts of Compton, Inglewood, and LAUSD to reach the standards of experience that we witnessed. Imagine AT&T Shape as a sustainable model for bringing the speakers, Hackathons, and demo workshops into our classroom and the Digital Content Lab we envision inside of Hart Beat University. We took notes and will socialize our capture with Tech-Entertainment thought leaders on utilizing AT&T Shape as an inspiration and a tool to construct a true STEAM pipeline for the creative economy, especially those children and young adults who otherwise may never know how technology and immersive story telling is changing their world.